In recent years, researchers have discovered a common link between all types of cancer: a process called inflammation. They found inflammation is the stimulus that converts normal cells to cancer cells. The problem was not caused just by brief incidents of inflammation, but, inflammation that lasted for many years, chronic inflammation. Most often cancer patients had suffered for a long time (often more than 10 years) from inflammatory diseases, such as arthritis, autoimmune disease, diabetes, or a chronic infection, before the cancer showed up later. Even low-grade, smoldering inflammation as in osteoarthritis, prostatitis and mastitis can be linked to a high risk of cancer. Tooth or gum infections are very common. (For this reason I personally rinse my teeth with a bit of Lugol’s iodine in the water to avoid infections.) On top of it current inflammation makes a cancer much more aggressive and invasive, and more likely to metastasize and reoccur. The big question is why is the cancer epidemic occurring in the most advanced countries in the world? Most of us are aware that this has a lot to do with our diet. Besides eating too many processed and sugary products, people are exposed to dangerous polyunsaturated vegetable oils containing a lot of Omega-6 like corn oil. These promote inflammation. Another important contributing factor is that in the US every year 1.1 billion pounds of pesticides and herbicides are used. These toxic chemicals are carried all over the planet, in the air and water, even to the polar ice caps. Nobody can totally escape from them. And, these all cause inflammation. The best we can do is to personally as much as possible, to eat organic, clean, unprocessed, mostly alkaline, plant-based food. Because there is nothing we can take that will not completely reduce our exposure to chemicals, it is also beneficial to use pure sulfur-rich Himalayan black salt with your food to support your liver in the detoxification process. The best prevention is to AVOID all of those Omega-6 oils and increase the intake of Omega-3, which is generally anti-inflammatory. A better Omega-3 to Omega-6 ratio in a food is an improvement but still not enough to take care of the problem. There are small amounts of Omega-3 in foods like walnuts, beans, wild rice, etc., but usually it is not sufficient in today’s environment. It is a good idea to supplement with the best possible, stable Omega-3. I believe this is money well spent. 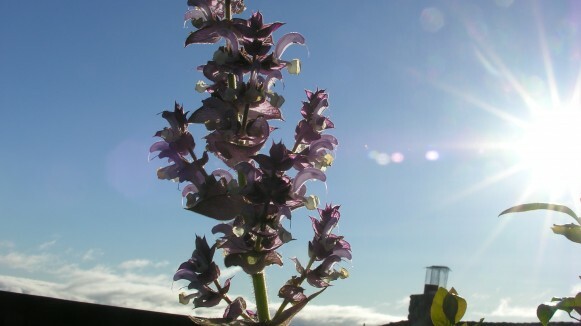 The most important thing we can do is to start making Clary Sage Seed oil, the only known stable Omega-3 oil, a daily routine. This is a smart choice. Life and health are precious.